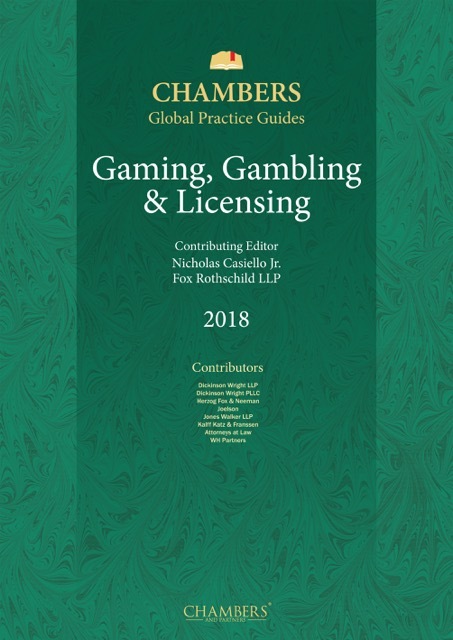 The Gaming, Gambling & Licensing guide provides expert legal commentary on key issues for businesses. The guide covers the important developments in the most significant jurisdictions. Fox Rothschild LLP is nimble, entrepreneurial and resourceful; qualities you want in your lawyers. It’s how the firm has grown to an 800-lawyer national law firm with 22 offices. We listen to our clients and our lawyers, then we act on what we hear. Fox gives clients the focus and service of a boutique – with the reach and resources of a national firm. Individuals and businesses – public, private and non-profit; start-up, family-run and multinational – receive our unwavering commitment to client satisfaction. Expansion, globalisation and consolidation are the three words that summarise the state of the gaming industry. Thirty-five years ago, casino gaming was a rarity in the United States, as opposed to its long-established history in Europe. Horse racing and state lotteries were prevalent in the United States at that time, but their popularity had been stagnant or on the decline for many years. The growth of casino gaming in the United States began when New Jersey legalised an unlimited number of casinos in Atlantic City in 1976, with the first Atlantic City casino opening shortly thereafter, in 1978. Now, casino gaming is common in the United States, with 24 states having commercial casinos and 28 allowing Native American casinos. Ironically, the spread of casino gaming both helped and hurt the horse racing industry and state lotteries in the US. Some states tied casino gaming to horse tracks, thus increasing purses and growing attendance with improved facilities and additional amenities. Some states allowed lotteries to expand into the video gaming area, using machines that, to the player, look the same as slot machines. Four states now have video lotteries. Nevertheless, the horse racing and lottery industries suffered in those states that did not link casino gaming to horse tracks nor allow video lotteries. Europe still leads the US in many ways, specifically with respect to sports wagering and internet gaming. Nevada was the first state to have casino gaming, and remains the only state that has true sports betting in the US. Three states have internet gaming: Delaware, New Jersey and Nevada. Delaware and New Jersey allow all forms of casino games, while Nevada limits its internet gaming to poker. The three states recently announced a pooling arrangement for internet poker. The expertise and sophistication of European internet gaming operators is obvious from the number of such companies providing systems and other expertise in New Jersey and Nevada, including GVC Bwin, 888, Gamesys, and Paddy Power Betfair. The spread of casino gaming has continued into Asia. In 2001, Macau eliminated its monopolistic approach and has become the casino gaming capital of the world, surpassing Las Vegas in gaming revenues. Two integrated casino resorts opened in Singapore in 2010. Japan is on the path to permitting an undetermined number of integrated resorts with casinos and, of course, Malaysia has been home to one of the finest and largest casino resorts in the world since 1971. Several countries in the area, such as the Philippines, South Korea and Cambodia, have had casinos for many years, but are undergoing major changes and expansion. In South America, Argentina, Chile and Paraguay all have casinos. Paraguay recently modernised its regulatory system and brought it closer to international standards. Casino gaming is illegal in Brazil, but legalisation is under consideration, as it has been on and off for years. If it is legalised, Brazil would be a huge market. In Central America, and similar to Brazil, Mexico has considered modernising and expanding its gaming laws for years; hope springs eternal that it will be successful soon. Full-scale integrated resorts with a limited number of licences issued as part of a competitive tender process are the trend now throughout the world. While Macau utilised a tender process and only issued a limited number of licences, Singapore has set the bar for the integrated resort concept. Japan is likely to utilise Singapore’s approach. It is the same method used by Cyprus in issuing a casino licence earlier this year, and is the approach currently being used in Barcelona. Very few companies have the wherewithal to successfully compete for and construct integrated resorts at a cost of several billions of dollars. In alphabetical order, those companies include Caesars, Hard Rock, Las Vegas Sands, Melco, MGM Resorts, Resorts World and Wynn Resorts, all of which already operate integrated resorts or have plans to. Another trend that has occurred in recent years is consolidation in the manufacturing segment. Scientific Games, formerly primarily a lottery company, now owns Bally Gaming, which previously acquired Shuffle Master and WMS Gaming. In 2015, major lottery company GTECH merged with IGT; the two companies' prior acquisitions of other gaming companies are too numerous to list. Aristocrat acquired VGT in 2014, and Novomatic intends to acquire Ainsworth Game Technology. New companies, however, may still have the opportunity to make inroads based on creative technology, including the development of skill-based slot machines. As noted earlier, internet gaming is prevalent in Europe but quite limited in the US, although this dynamic could change dramatically in the next few years as several states are considering legalisation, as long as federal law does not revert to the way it was prior to a 2011 interpretation under the new President. Several of the internet gaming providers have also experienced consolidation in recent years, including GVC and Bwin, and Paddy Power and Betfair. A federal law enacted in 1992 has prohibited the expansion of sports wagering in the US, but the US Supreme Court will consider a challenge to the constitutionality of that law in 2018. A repeal of the 1992 law is a long shot, but public opinion in the US has changed, with a majority of Americans now supporting legalisation. Broad legalisation of sports betting in the US will also create an opening for European operators, several of whom are already well positioned in the US because of their internet gaming operations. From a legal and regulatory perspective, globalisation and consolidation of the industry has increased the complexity of compliance and raised the bar. Companies must comply with the laws of many jurisdictions, and the most stringent requirement of a jurisdiction is now the minimum that companies must comply with across the board. Globalisation has also raised the licensing standards as gaming authorities learn from each other and adopt best practices from around the world. Overall, the gaming industry – whether casinos, lotteries, internet or sports betting – is healthy and will continue to expand for years to come.